Payne Transportation celebrates safety, service and announces Driver of the Year at Annual Awards Gala. - Payne Transportation Ltd.
You are here: Home / News / Payne Transportation celebrates safety, service and announces Driver of the Year at Annual Awards Gala. Payne Transportation celebrates safety, service and announces Driver of the Year at Annual Awards Gala. Payne Transportation held its annual awards gala dinner and dance on Friday November 25, 2016 at the Hilton Airport Suites in Winnipeg. The annual gala is the opportunity to come together as a large group and celebrate the achievements of the drivers who have committed to making safety a priority and to recognize those individuals who are celebrating years of service milestone anniversaries. At the gala, one driver is selected annually as the Payne Transportation Driver of the Year. This individual exemplifies what is means to represent Payne’s high performance standards and commitment to excellence. 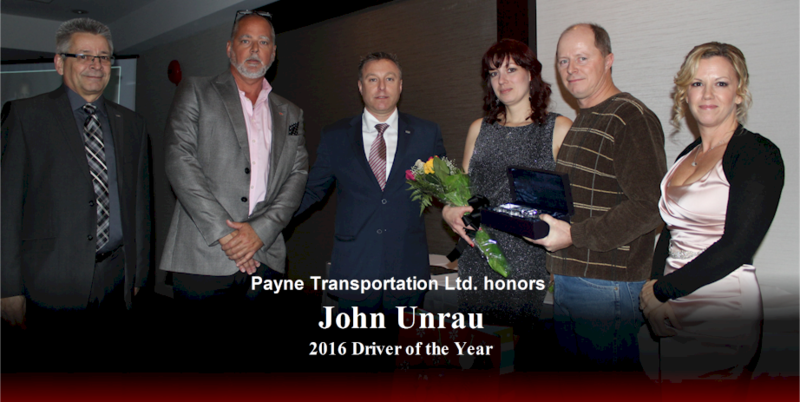 The 2016 Payne Transportation Driver of the Year is owner operator, John Unrau. John has been with Payne for over 4 years. His peers say that John is a great ambassador for Payne Transportation in all aspects of his job, he is a dispatcher’s dream to work with and constantly supersedes what is expected of him. There were 6 finalists out of many nominations for 2016 Driver of the Year. They were, 1st Runner Up, Brian Kemp and finalists, John Bekus, William Friesen, James Wall, and Mark Little.